Saturday- My knee seemed to be doing okay. Bob dropped me off for a mani/pedi. Meanwhile, he stopped at Costco for gas and picked up subs at Subway. He picked me up and we took off for the mountains. Our planned destination was Mt. 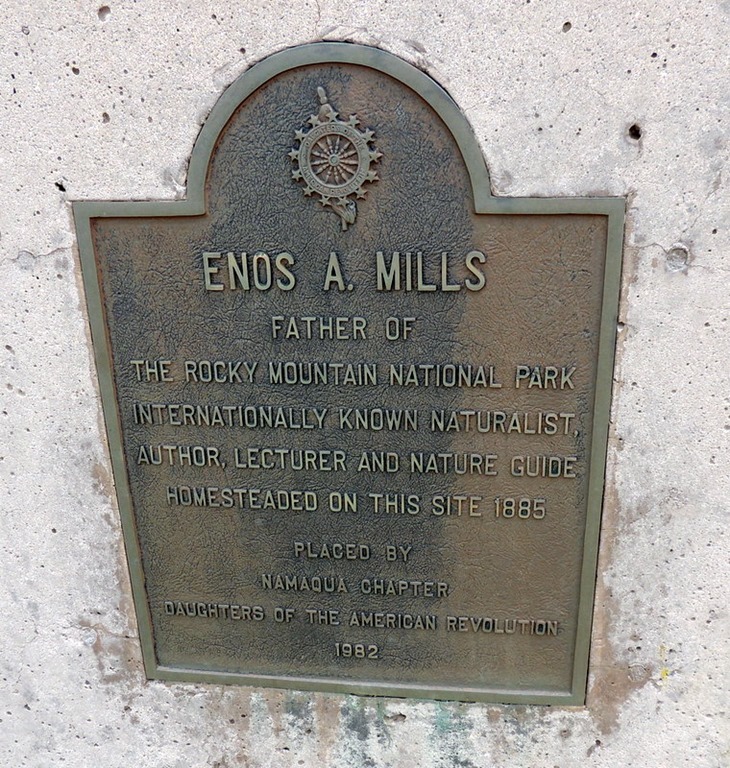 Evans, taking the highest paved road in North America. The GPS informed us that I-70 had construction and a 1/2 hour back up. The road started backing up prior to Floyds Hill, so we detoured at Evergreen. East bound was clear, so we thought it would be okay to take make a loop and take I-70 back home. 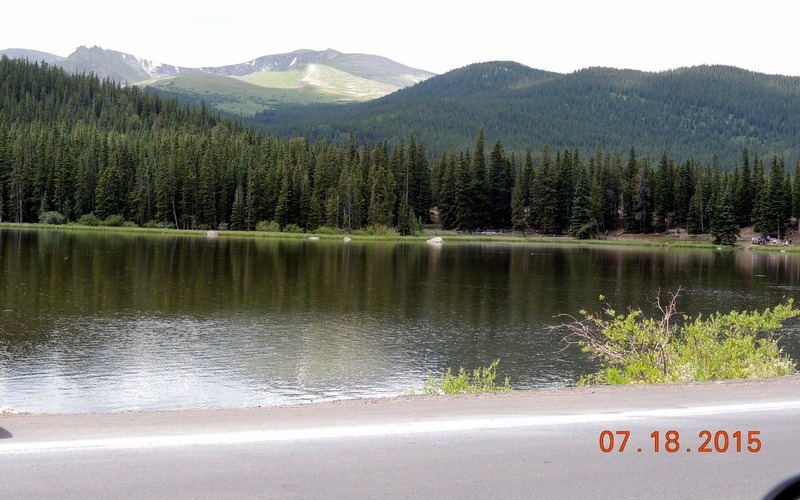 This picture is of the Rockies, just west of Chief Hosa on I-70. In Evergreen we turned onto Squaw Canyon Road. Signs told us that the road to Mt. Evans was closed. 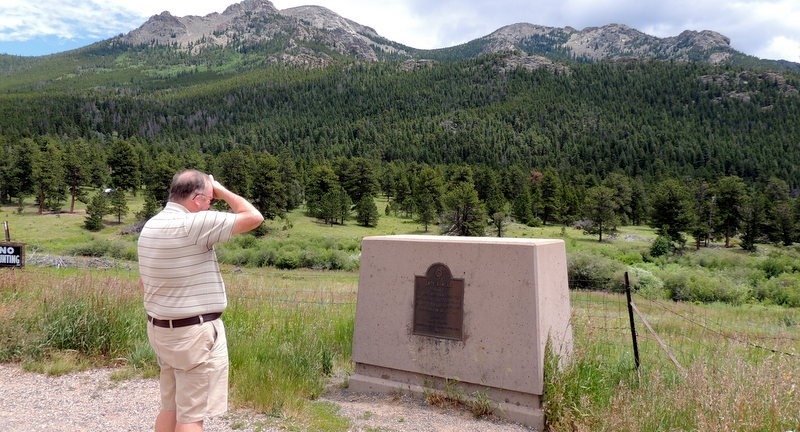 They also said that the visitor center was closed, but that turned out to not be true. We decided to continue upon our way. We had taken the dogs with us and Karlie asked us to stop for a potty break, so we pulled off on the side of the road. I changed from my flip flops to walking shoes and Bob walked the dogs. These are the foothills. I took this picture of the view. The road continue up, and up! We were not sure how far up we were going. Mt. 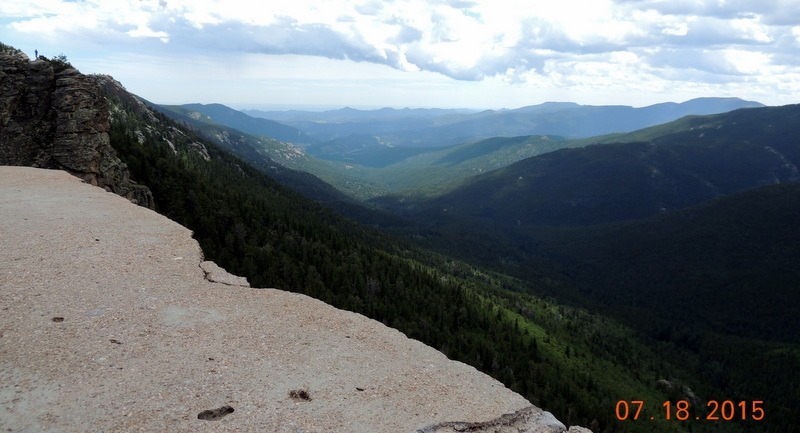 Evans is at over 14000 ft. There were a lot of bikers on the road. I do mean bicycles! The uphill lane had a bike lane, but the downhill does not. It made for some slow, scary driving, as the road had a lot of curves. 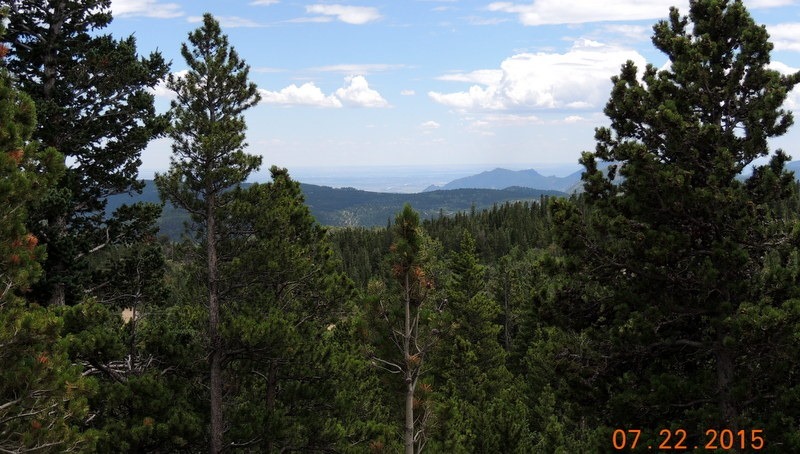 It was a beautiful drive, through evergreens with views of the valleys and other mountains. 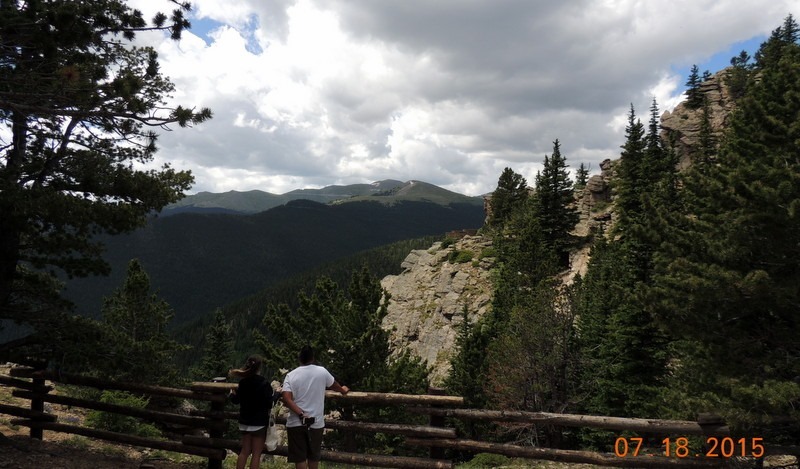 We stopped at the Arapahoe National Forest Juniper Canyon overlook for lunch. 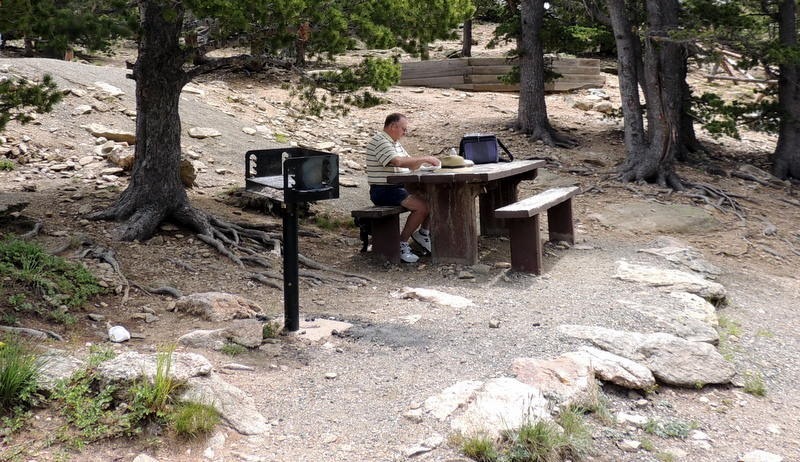 Here is our picnic table and the view from our picnic table. 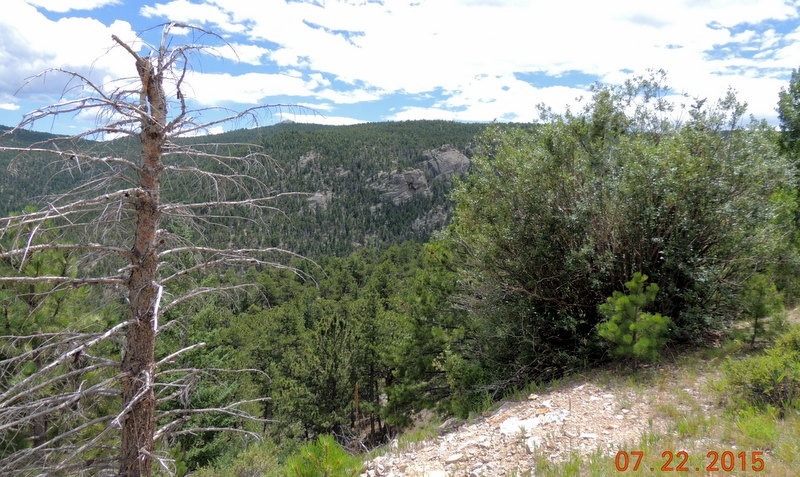 We could see an overlook, so we took the trail out to the Juniper Canyon overlook. I walked really carefully! We had not seen any wildflowers until we walked out to the overlook. The temperature had dropped from the high 80’s to 61 degrees! We need to add jackets to our ‘go bag’. The view was pretty. obviously a popular place. All the parking was full and so was the side of the road, going both directions. We were now traveling downhill. The picture does not show the steepness or the sharp curves. 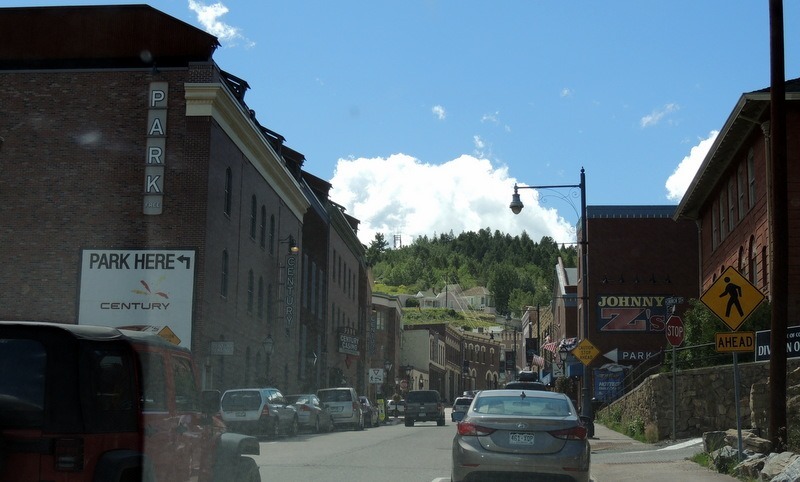 We continued on to Idaho Springs. While on the way downhill, I was passed by a guy on a bicycle! The speed limit was 30 and I was doing 40, and he passed me! Since it was still early, we decided to take the scenic drive to Central City. We started on the road to find that it was closed at the bridge. So we made a U-turn and took I-70 east home. That was okay, as the skies were getting dark, as the afternoon thunderstorms were building in the mountains. Back down in Westminster the temp was still in the high 80’s and it was bright and sunny. We arrived home and took a nice nap. We would have gone to social hour, but during our nap the thunderstorms had arrived. So far we think there have only been 7-8 days that it has not rained since we arrived in April. We went to dinner at the Lodge. Dinner was chicken fried steak with mash potatoes and carrots. We sat talking with the other RV’ers until after 7:30. We returned home and watched the DVD, Visions of Scotland. Sunday- We did our usual Sunday morning budgeting and catching up on bills. The mail had come in and we had to write checks and get them ready to mail. I did my exercises, then we took off for downtown Denver. 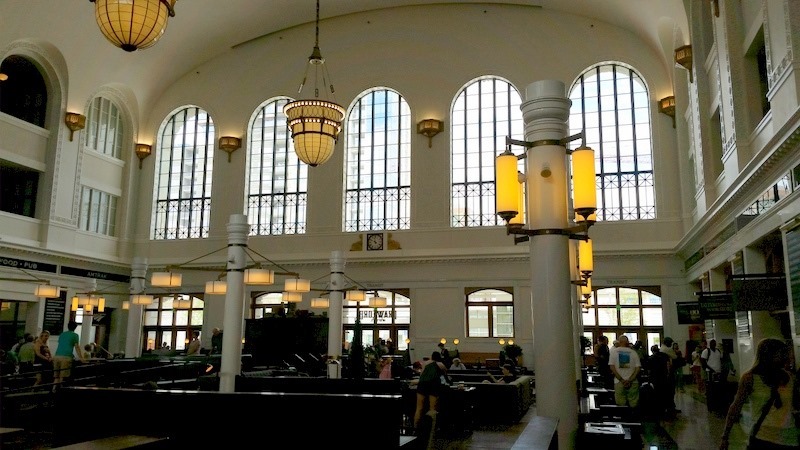 Our destination was Union Station to the shops and to eat lunch. We were able to get a parking place at a free meter, directly across from the entrance. We wandered through, but were not impressed. 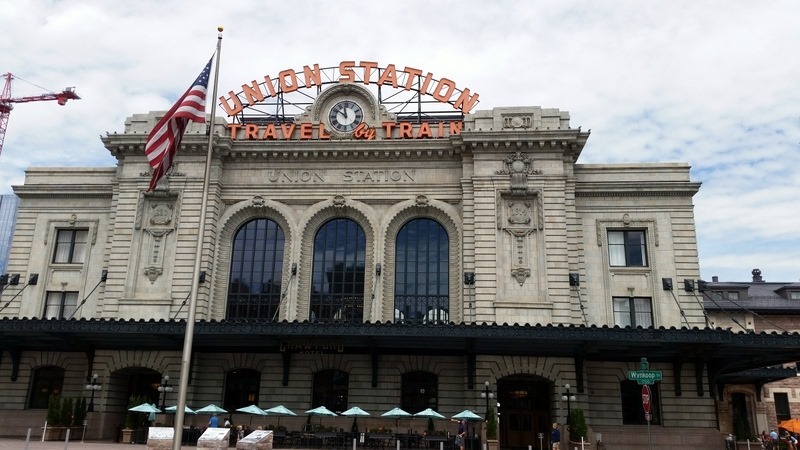 It is much smaller than the Union Station in DC and had only a couple of shops. The restaurants did not thrill us and were very expensive. One was really crowded and we did not want to wait in the long line. So we hopped back in the car and went to Maggianno’s for lunch. We could not get a parking place on the street so we paid $10 for a parking place in a lot for one hour! Whew, expensive!! We ate a nice lunch, then drove back home. Dinner was at home with left over Italian. We watched TV, read, played video games and went to bed. Monday- I had PT at 11 am, so we went up to PT. 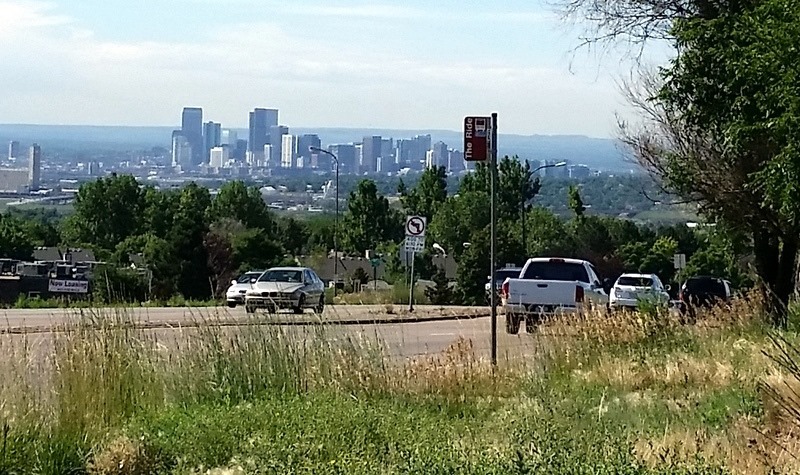 Here is a picture of Denver from up near the PT office. It is quite a view on a clear day! Westminster is northwest of Denver. 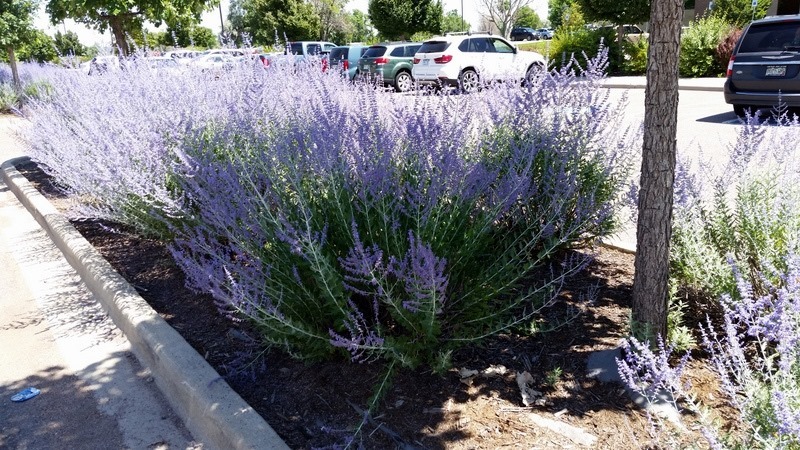 Here is a picture of the lavender in bloom outside the PT office. The picture does not do justice to the beautiful flowers. Sara measured my knee and I have hit 115 degrees bending. My goal was 110, so I am now ahead! All those exercises are paying off. Now if I would just turn the corner on the pain. Sara says that some folks take longer than others. Lucky me! We were both glad that I did not have another inflammatory flair after the increase in exercises last Friday. Today, she had me sit on the side of the table and bend my leg back. She said that now we were past what she had been doing. I was happy, and she laughed and said don’t get too excited, now we move on. She had me turn over on my stomach and pushed back on the leg. More painful, stretching the muscles. Oh well, at least it is progress! We returned home and ate leftovers for lunch. Then I literally crawled into bed. Bob left and took the towels to the Laundromat, and I slept. I slept through his return, putting the towels away, and taking the dogs for a walk. I was too tired to go grocery shopping with him. I stayed home and tried to wake up. I know it is the drugs, but wow, I am tired of all these naps! We ate dinner at home, and watched Mr. Selfridge, season 1. Tuesday- We were up really early, as Bob was taking the Edge to the dealership. We needed the GPS updated and for some reason the setting for the seats only stays for about a week. We need to get these done prior to the end of the warranty. So he left at 7 AM for an 8 AM appointment in Longmont. We stayed in touch by text. I worked on ordering books on CD from Paperback Swap. I am closing out my account with them since they now charge $0.50 per swap. I can get too many books for free at RV parks. At the dealership, Bob discussed the GPS. We can’t find a lot of places. The repair guy told him he needed to purchase a new card. He did and went to replace it, finding that we had the newest version. He returned the card and got a refund. The other issue is that we can set our seats, but for some reason it only lasts for a week. The dealership called Ford and there is no fix for this. When Bob returned home, he went on line and evidently a lot of people have a problem with this issue. There is no fix. Oh well. Just a waste of time! When I took the dogs out for a short walk after lunch, Karlie could not get up the steps of the MH. I had to pick her up and take her up the steps. A feat, as I have enough trouble getting myself up the steps right now. Later we noticed she was limping. We decided to see how things are going tomorrow. Bob returned after lunch. He had the dealership shuttle take him to the local Jimmy Johns and got a sub. The driver was impressed that Jimmy Johns was so fast. I took a quick nap and we went to social hour. We did not like the selections for dinner at the Lodge, so Bob ordered Chinese carry-out. Wednesday- We got up and Karlie was still limping and in obvious pain from her right rear leg. The lymphoma is right on her stomach, just in front of the leg. The Vet had said that she might start to have walking issues, so we hope that is what the problem is…. We had planned to have it removed in October, during canine dental month, so that we would have her teeth cleaned at the same time. There is a big discount on teeth cleaning in October. Oh well, we just hope that is the problem. I made a vet appt. for tomorrow at 1:30. Our plan for today was to leave early. We did not make it! We did not leave until 10 AM. 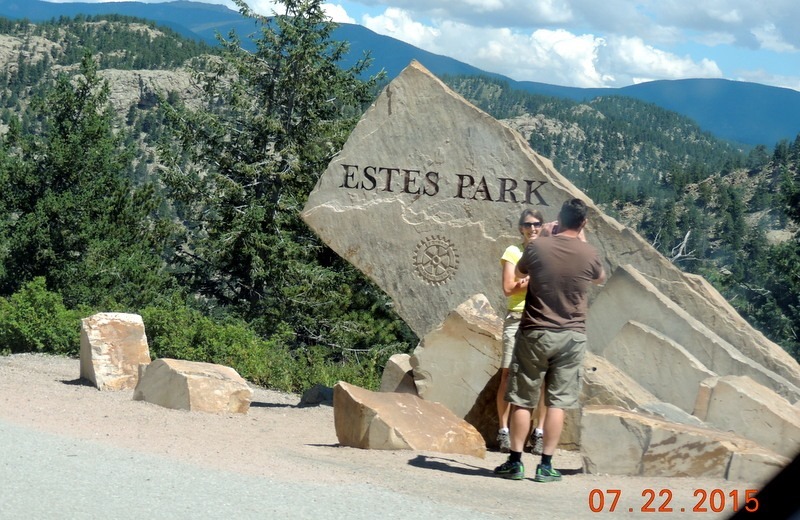 Our original plan was to drive the Peak to Peak scenic by-way from I-70 to Estes Park. 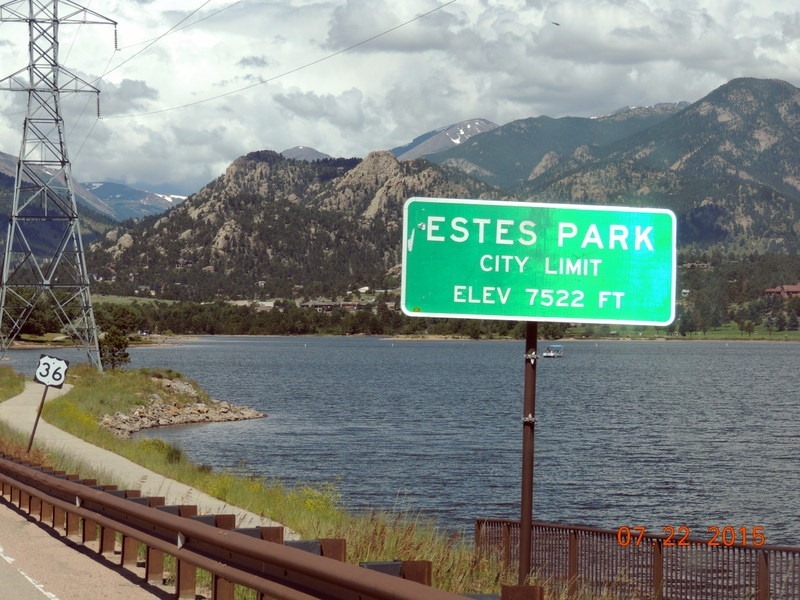 We planned to have a late lunch in Estes Park. Since we were so late leaving, we decided to reverse directions. We stopped at Costco for gas, $2.59/gal. We drove on Hwy. 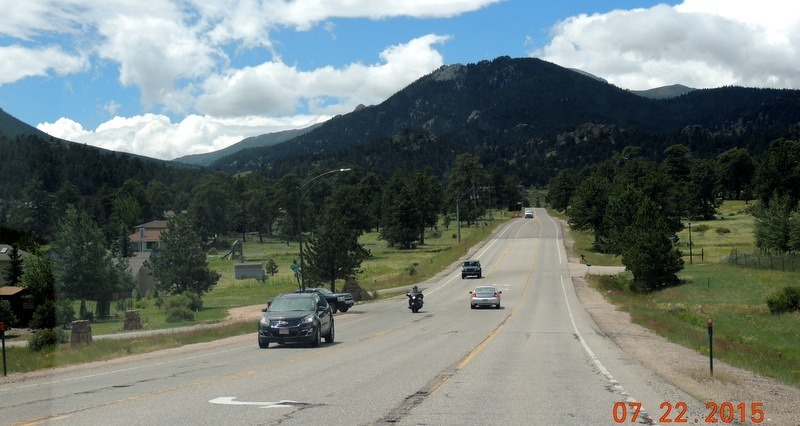 36 through Boulder directly to Estes Park. 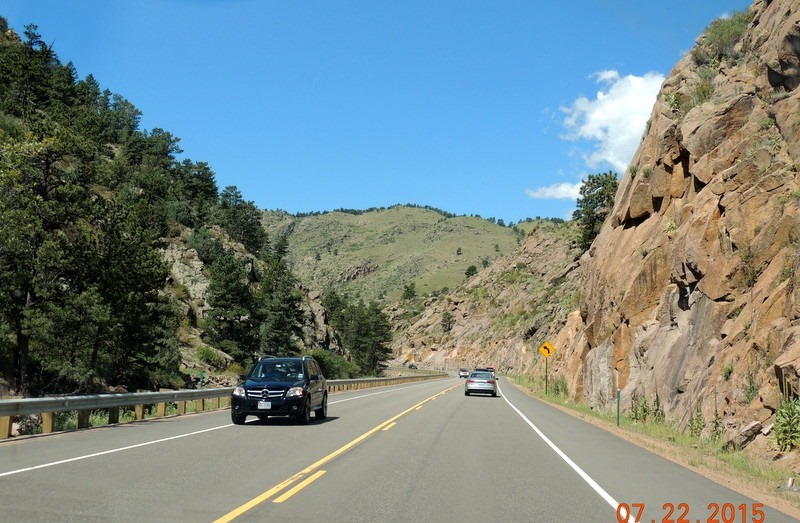 Below, Hwy 36 before Boulder. There were a lot of bikers on the road. We thought that most people would be working. Nope, they were out bike riding on Hwy. 36. 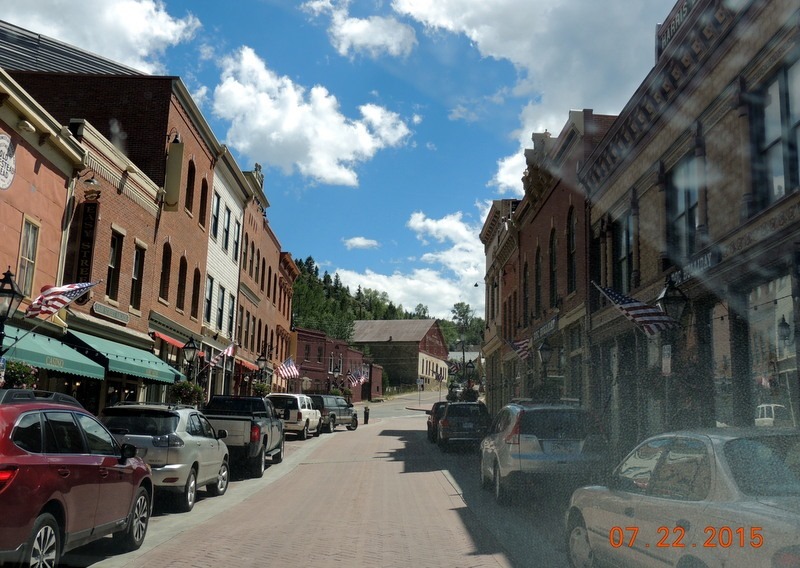 After the cute little town of Lyons, the bikers seemed to thin out, to only occasional riders. There were also a number of motorcycles on the trip. Above, this was right at a T-intersection in Lyons. 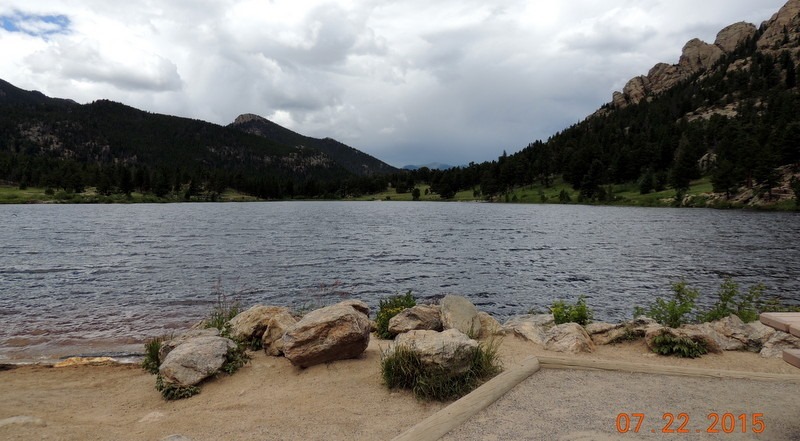 Here are some scenes between Lyons and Estes Park. We stopped in Estes Park at Notchtop Bakery & Café Cafe .Bob had a Polish Sausage sandwich and I had scrambled eggs with turkey bacon, toast and fruit. We left there and took Hwy. 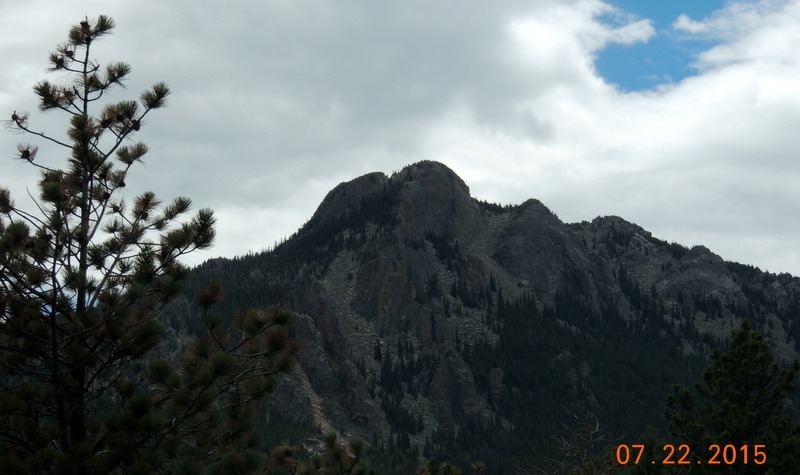 17 south, starting the Peak to Peak by-way. 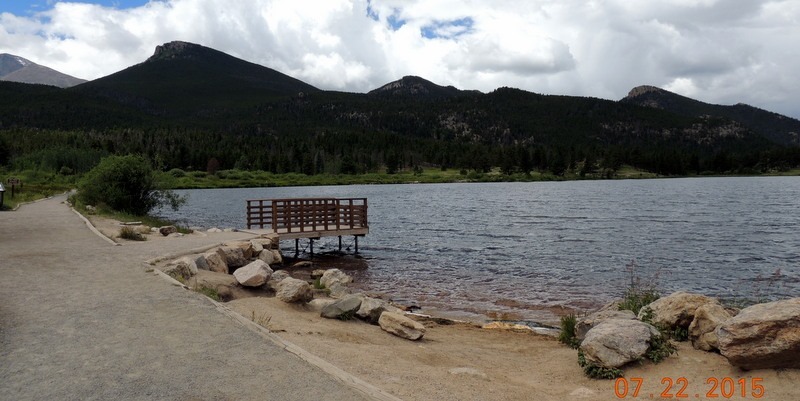 Our first stop was at Lily Lake. 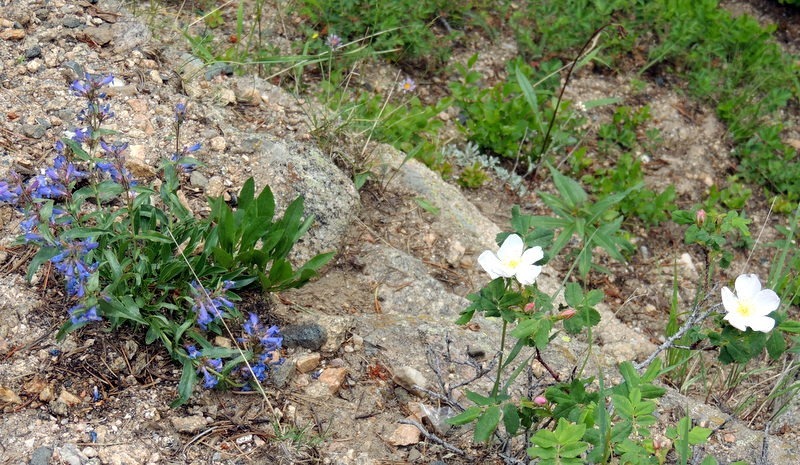 No lilies, as early homesteaders periodically drained the waters causing the flowers to die. 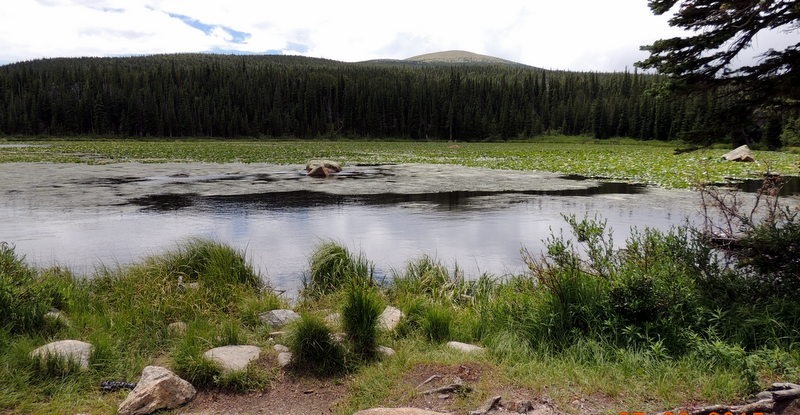 The last two pictures above were taken on the winding road to Brainard Lake. 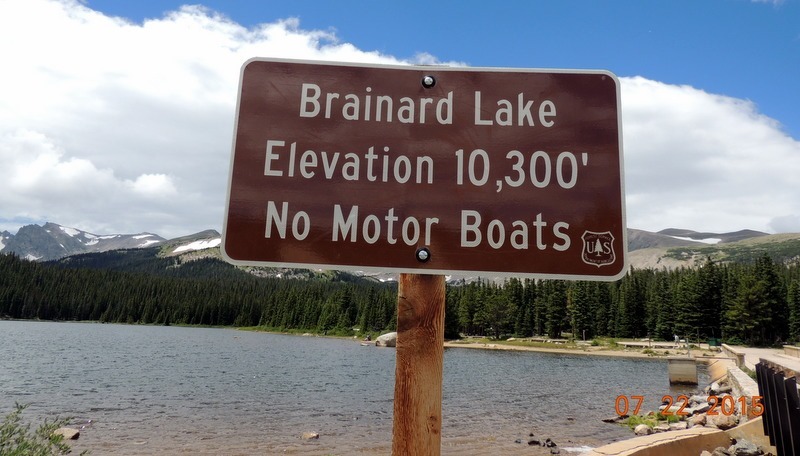 We stopped at Brainard Lake Recreation Area. 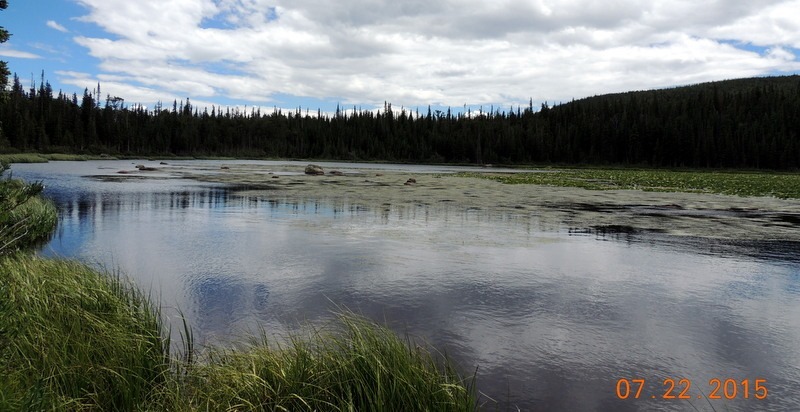 This is a National Park, about 4 miles off of Hwy. 7. It was 2 winding, long, slow miles to the entrance to the park. 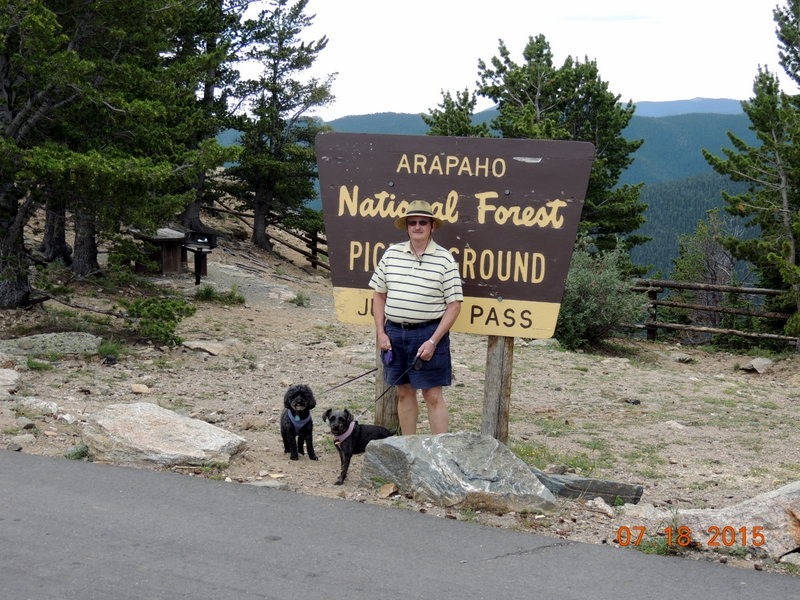 There was a fee to enter, but we have Bob’s National Park card, so it was free! There are two lakes. 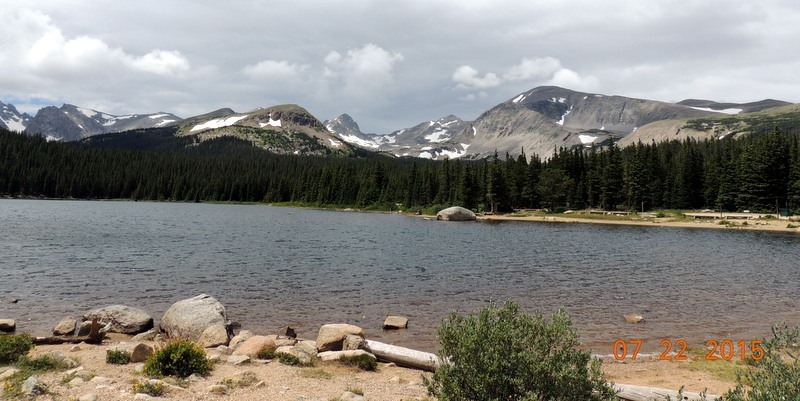 The first, and smaller, was Red Rock Lake. We continued on to the Campground. It was nice, but no hook ups. We would be able to get the MH in and would not mind staying a week or so there. Nice big sites! 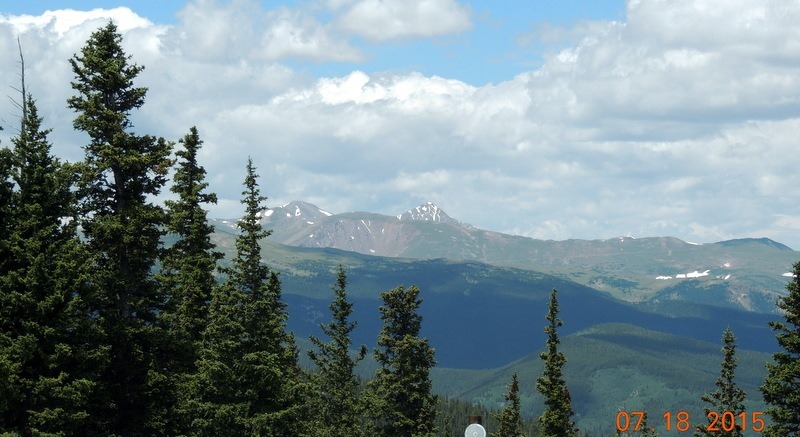 At this altitude, the temperature was 61 degrees, It was windy, but sunny. The lake was pretty and there was a nice trail around the lake. We did not take the walk. 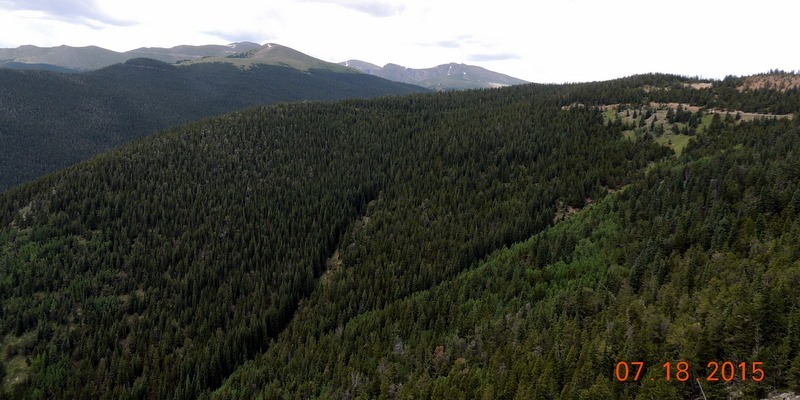 This was the Roosevelt National Forest. In the town of Nederland, we saw the Black Forest German Restaurant which we had heard of from Julie, the camp host. Hwy 17 became Hwy 119 at this point. 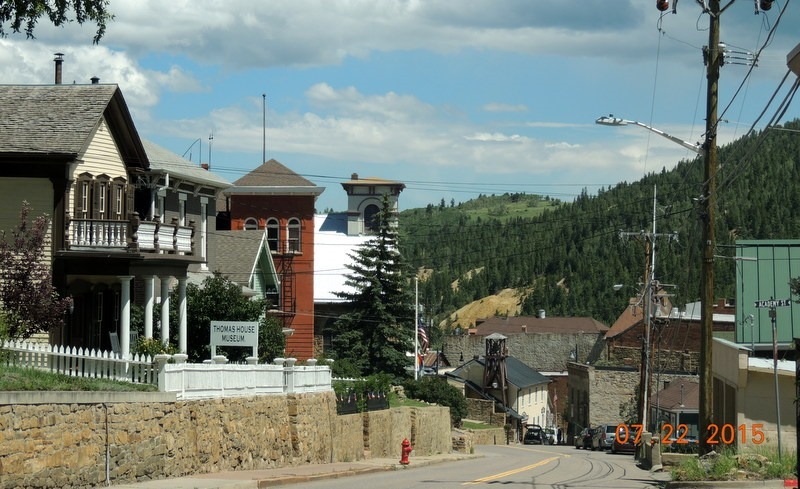 We continue on to Black Hawk/Central City. There are a lot of casinos, 25, between the two small towns! 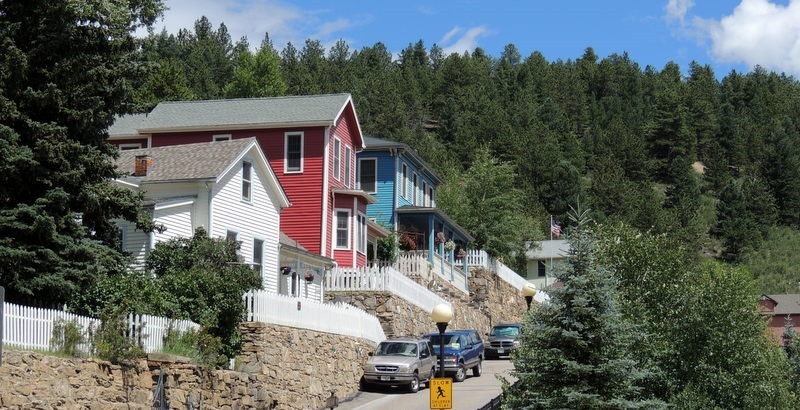 We entered through Black Hawk to see these restored homes. Above is the restored train station. We turned right and went up to Central City. 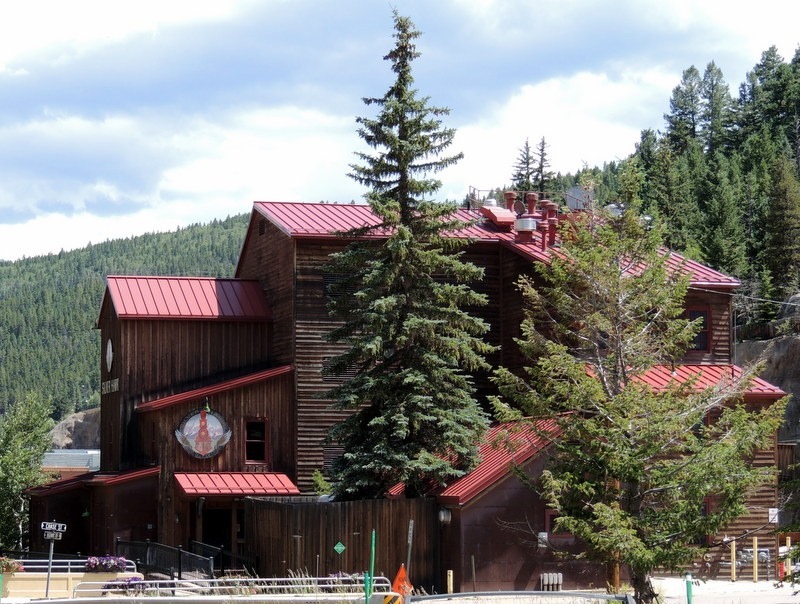 Most of the casinos were small, except for Ameristar and The Lodge. 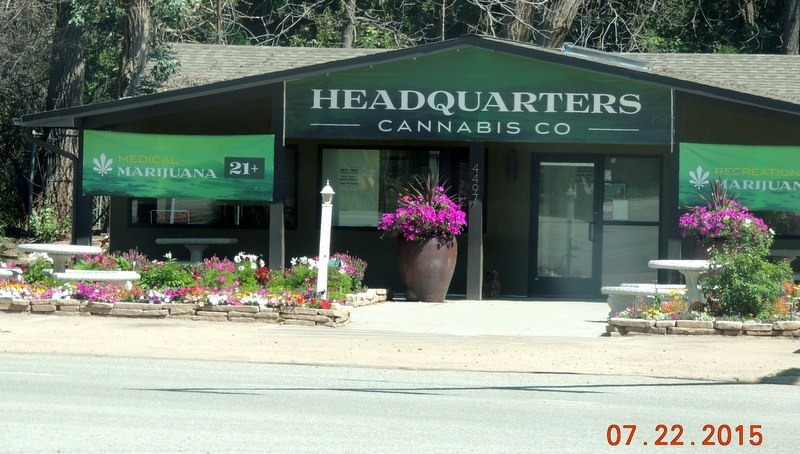 We see commercials and bill boards for them all over Colorado. It was interesting to visit the towns. 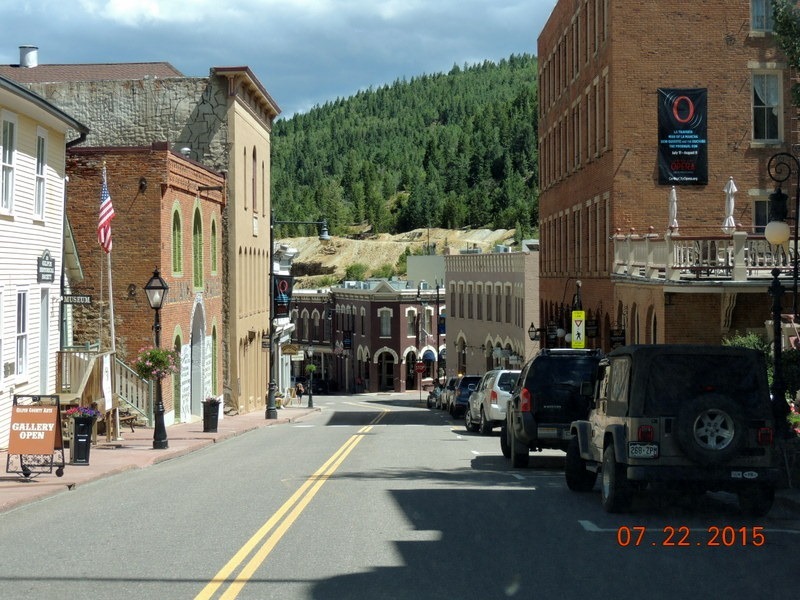 Central City was known in 1859 as the “richest square mile on earth”. Some 2 million dollars in gold were found, those were 1859 dollars! Now of course they are mining for gambling dollars! Above on the right was the “Doc Holliday”. He sure got around! Above is the Ameristar, which is by far the largest casino. 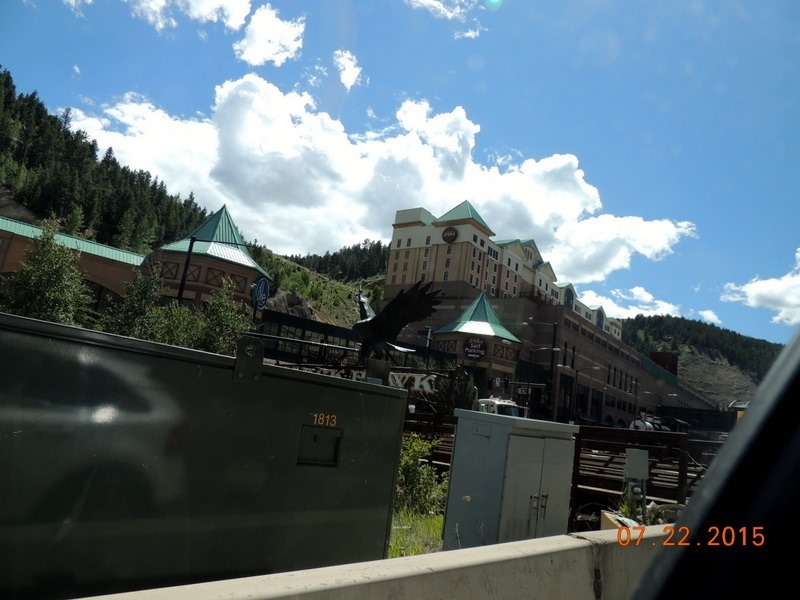 Also, you can see the “Black Hawk” in the picture. 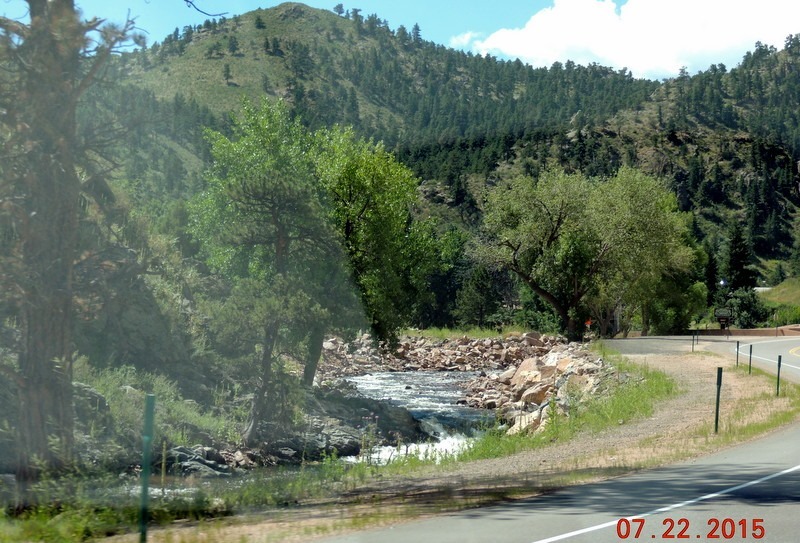 We continued down Hwy 119 which became Hwy.6 along Clear Creek. 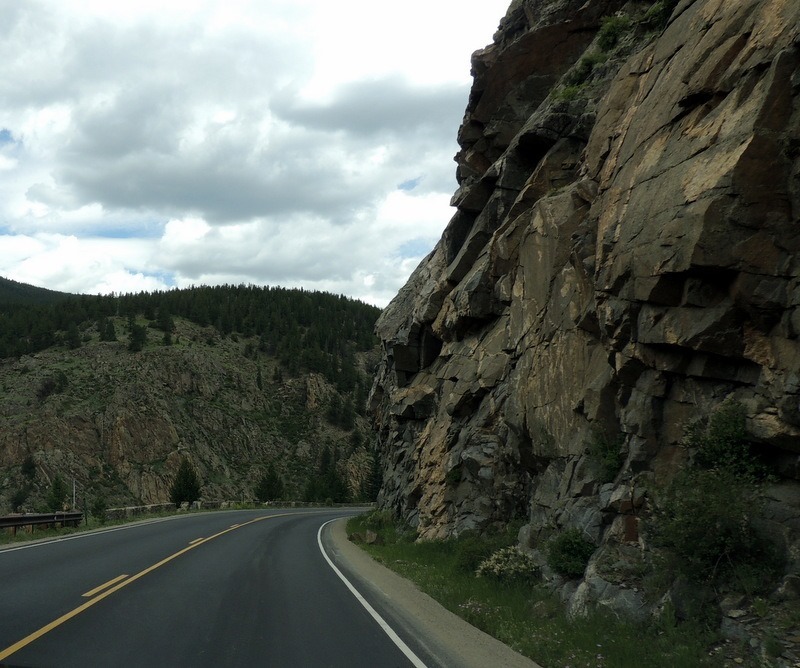 The road was very pretty, along the fast moving creek and through rock canyons. Lots of twists and turns. A lot of traffic! We stopped in Golden for ice cream at Golden Sweets. We each had one scoop in a cup. Bob had raspberry/chocolate gelato and I had chocolate chip. We returned home to happy dogs. We ate Chinese leftovers for dinner. It was a beautiful evening so we sat outside with the dogs, reading and enjoying the evening. Bob put Karlie in my lap as I was on the recliner and she sat there contentedly. Roxie sat on the end of the wall, protecting us from rabbits! We are having to carry Karlie up the steps although she does okay with walking, once she gets going. Thursday- Another busy day for us. Bob made some dog food with beef to see if Karlie would eat better with the beef. She did. He also put the bowl on a rug, instead of on the laminate floor. I went to PT. My leg bending degree is now 121! After 120 they do not worry about the leg. Normal is 130-135. In the OR, I was 130. So I am getting there! Dr. Foran may not have to bend the leg under anesthesia to break up any scar tissue, although I think he will anyway. I picked up lunch at Micky D’s on the way home, we ate lunch and I tried to take a short nap. But since it was post PT, I was having shooting pains in my leg. So much for a nap. We left at 1 to go to the Vets. He checked Karlie, once we dragged her out from under the bench ( LOL). He had me walk her, then he checked the leg and the hips. He said it was not the benign tumor, as that had not grown much. When he felt her back/hips, he felt a weakness in the muscle, almost a divot or slit. I could feel it and so could Bob. That muscle is weak. So the Vet decided it was arthritis. He gave her a dose of an anti-inflammatory and a Glucosamine powder that we are to add to her food. Once they kicked in later in the afternoon, she actually played. Yea, our pup is back! We returned to the MH. At a little before 4, I left to go to my massage. I returned and we went to dinner at the Lodge. It was Taco Thursday. Of course everyone wanted an update on Karlie. It is a small community! After dinner, we took the car to the car wash as it is not supposed to rain for the next few days. We returned home and settled in for the evening. It was still really hot outside, 95 degrees, so we stayed inside. At around 7:30 there was a knock on the door. It was Paul, Da Builda; he is making the door for us. He wanted to re-measure the area. Bob counted how many new door catches that we need and Paul is going to pick those up for us. The majority of the latches are plastic and keep breaking. Paul has some metal ones that he had put in Paula and Charlie’s MH. They are actually less expensive than the plastic ones. Bob is tired of replacing the plastic ones. After Paul left at almost 8:30, we watched two more episodes of Mr. Selfridge. Friday- We had a busy morning then I went to have my hair done at 1 PM. We went to social hour, then to dinner with everyone at the Lodge. Tonight we had fried shrimp with carrots and rice pilaf. We sat talking about Genealogy with some of the RV’ers. We watched more Mr. Selfridge.